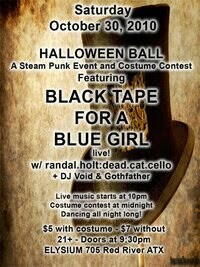 Oct. 30 @ 9:30pm @ Elysium: 705 Red River St, Austin, TX. Featuring: BLACK TAPE FOR A BLUE GIRL + randal.holt:dead.cat.cello & DJs Void + The Gothfather. Live music starts at 10pm. Costume contest at midnight. Dancing all night long! $5 with costume, $7 without. I'll be a vendor there; come by and see me!